A complex of over 72 naturally-occurring ionic trace minerals. Citric acid, certified organic cane sugar, natural flavors blend (raspberry, lemon), malic acid, silica, beet (Beta vulgaris) root powder, stevia reb A. Open packet and mix contents with 2-4 ounces of water. Stir until dissolved. For a calming effect, mix Mag Pak with hot water and sip slowly. 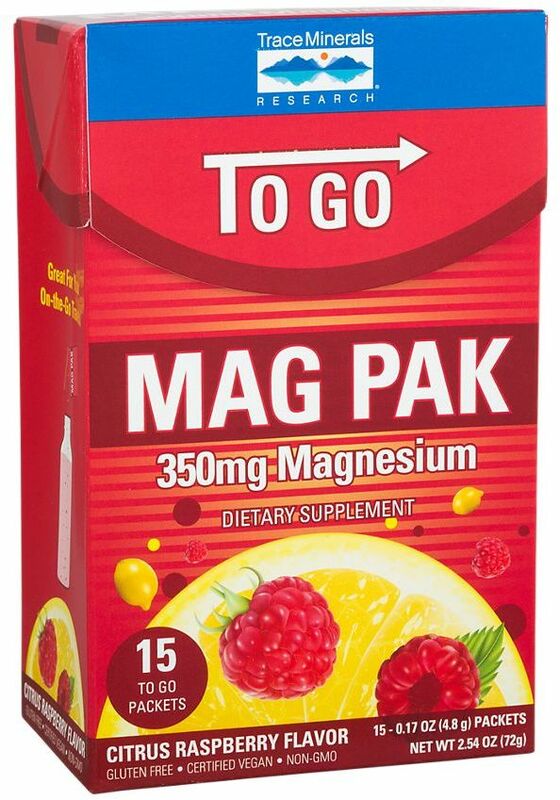 For a limited time, receive 1 free box of Trace Minerals Research Mag Pak To Go Citrus Raspberry 15 packets when you buy one at regular price. Do you know that recent studies estimate that almost 70% of Americans are not getting the recommended daily intake of magnesium? That's why we developed Mag Pak. 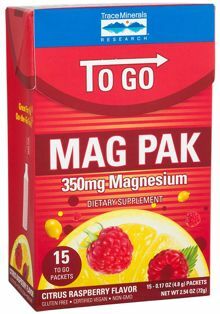 Mag Pak is a great tasting, naturally-flavored magnesium supplement that is formulated with a special blend of magnesium malate, magnesium carbonate, and citric acid that once added to water, creates magnesium citrate. Magnesium citrate is one of the most absorbable forms of magnesium and helps maintain healthy magnesium levels in the body when added to your daily supplement regimen. We also added a complex of over 72 naturally occurring electrolytes from Ionic Trace Minerals for a magnesium supplement that is unmatched in the industry. -A complex of over 72 naturally-occurring ionic trace minerals. Citrus Raspberry This is a Buy 1 Get 1 FREE offer!